I was reading some comments below about some readers finishing up their blushes and I recalled that I used to too. I had a favourite L’oreal Blush Delice in Rosy Cheeks that I nearly finished. The only bit left of it is the colour around the sides and I still use it when I travel. Absolutely gorgeous colour. But since then, I haven’t finished up any more blushes. My collection above should tell you why. *gulp* I’ve since given away some and added others as this picture was taken about a year ago so the brands aren’t accurate. Maybe I should update yes? 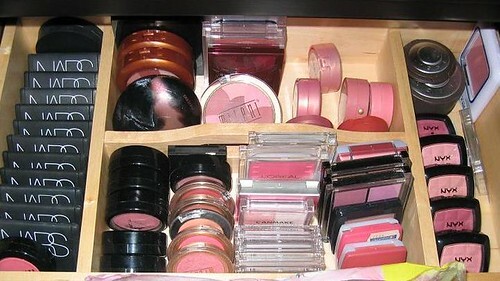 I wonder if they have rehab for blush addicts as they have drug rehabs? blushanonymous instead of alcoholicanonymous. LOL. PB says: heh… horrible right? How did you get the NYX blushes? Any reviews? PB says: I got them from a friend in the USA. They are really great and I’ll review them soon! Check back for the reviews in the next couple of days. I am impressed with you by the number of blushes that you owned. I have been a fan of your blog for quite some time and I have read most of your review on cosmetics and I love the frank comment you have given on some of the product. PB says: hee… yes I do and NARS is nice. I’ll review it soon. Go HK so many times, pass by NARS so many times but never buy their product…coz the counter there was dull looking. Haha. Damnit. PB says: I admit its dull and I only like the blushes. Review coming up soon!